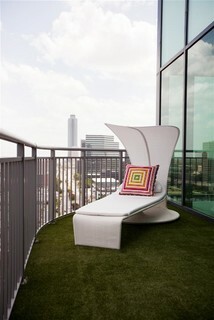 Popular home décor ideas website Houzz has 4156 photo shares of balconies with artificial grass. 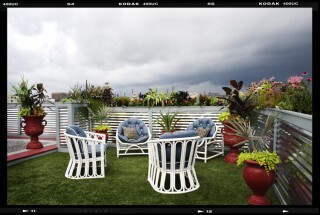 These amazing images show how you can enhance any space with versatile fake grass. This lush oasis in Miami is one of our favourites – we love the use of the vibrant orange and sky blue fabrics. It seems we’re not the only one’s either, the picture has been saved to 15,652 ideas books. An interior design company shared this Mediterranean style patio. The design feature has been created with slate tiles and crisscrossed strips of artificial grass, demonstrating the interesting design effects you can produce. Contemporary Deck by North Haven Home Media Design & Installation Opus Audio | Video | Control Inc. Even the smallest balconies can benefit from a little dressing up. 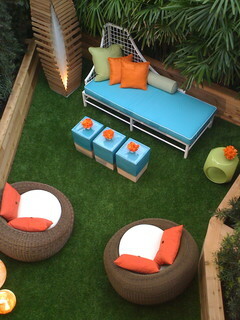 This small space has been transformed with a little fake grass carpet and a contemporary lounger. Modern Deck by Architects & Designers NEW THEME Inc. This modern rooftop garden is proof you don’t need soil to create majestic landscapes. The lawn is huge and looks just like the real thing. 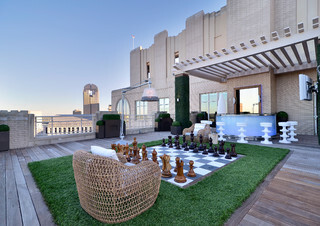 Have you ever seen a more inviting space to play chess? Players can lounge on these stunning rattan chairs, with soft artificial grass underfoot. If you’re researching the possibility of landscaping your roof, it may seem like more trouble than it’s worth. 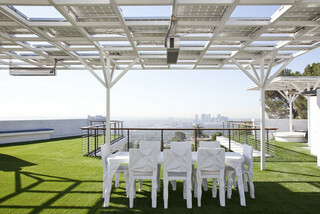 But creating your roof-top oasis doesn’t have to be difficult…the easy solution is to use artificial grass. It can be installed quickly and inexpensively, straight on top of concrete. You can forget about practical considerations like whether the structure can take the weight of the soil, or where to put the lawn mower. 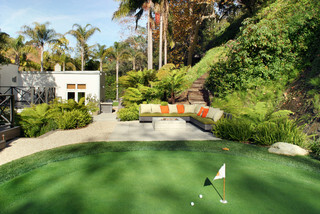 Artificial turf will give you a lush green lawn anywhere, with none of the hassle. It will stay this way too, without any maintenance. So there’s no need to worry about upkeep, watering or weeding. 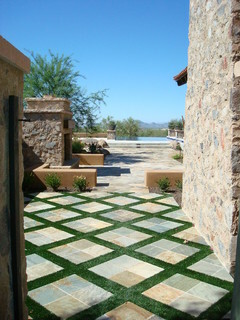 Once your turf is installed you can design and decorate your newfound outdoor space. Whether you want something sleek and contemporary, or elegant and traditional you’ll have a blank lawned canvas to work with. Use planters, pots, hanging baskets and stands to introduce trees, plants and flowers. Create a pathway with decorative patio stones. Add designer outdoor lighting to set the mood. Purchase outdoor lounge furniture to create a seating area. Add colour with vibrant cushions, throws and accessories. Decorate the walls with climbing plants or wall-art. Build/buy a storage cupboard to keep all your essentials – corkscrew, suntan lotion, BBQ utensils. Make it more private with clever screening. LeisureTechLawns have completed many projects on rooftops, patios, balconies terraces, and courtyards. If you’d like a quote for professional installation of artificial grass, call us on 01371 87 5901. Is your Garden Set for Summer? You can have lots of fun by creating an outdoor theme. Choose chic Mediterranean, trendy Miami-style, rustic bistro, country-cottage, vibrant tropical, or contemporary Oriental. Your garden probably lends itself to a particular style…just go with it. You’ll get more out of your garden by creating a space that you actually want to hang out in. This means lazy lounge chairs, relaxed bench seating, comfy cushions, and a place to keep some glasses and a cork-screw. This could be a water fountain, sculpture, gazebo, archway, a tree or feature wall. It will give your outdoor space a wow factor, adding interest to the landscape and creating a focal point. Do you see the garden as more of a hassle than place for enjoyment? You can cut down on the chores with some clever landscaping. Choose hardy plants that don’t need much TLC. Gravel borders to stop weeds. Install artificial grass and forget about mowing and edging. Whether its roses, a strawberry plant, an apple tree, or exotic tropical flower, plant something that will make you smile. Put it in a prime position so you can see it every time you look out the kitchen window. Posted in Artificial Grass Ideas, Landscaping Tips | Comments Off on Is your Garden Set for Summer?